Probiotic Dog Essentials is our other flagship dog probiotic and includes an easy to use scoop and 175 daily servings making it an economical solution for multi-dog homes. Each scoop contains a powerhouse of immune system builders. An amazing 45 Billion CFU's per scoop, up to 25 times more probiotic per serving than most products commonly labeled for dogs. Read the labels, your pet is depending on you to get it right and simply put, most probiotics marketed for pets are woefully lacking in both CFU's per serving and the number of beneficial strains included. 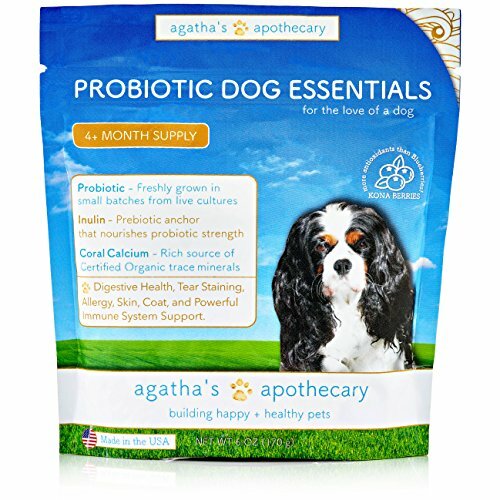 We decided when formulating our probiotic formulas that whatever it took, Agatha's would only offer truly powerful formulas or we wouldn't put our name on them! Contains antioxidant-rich Kona Berries for added vitamins and a clinical dose of Hawaiian Kona berry extract, which has the highest ORAC value of all berry fruits to protect cells from free radical damage and supports optimal heart and organ health. Most economical for multi-pet homes.